To prepare our students for the Upper School’s college-preparatory curriculum, Prairie emphasizes the development of individual skills in critical areas. In English courses, students work to improve their reading comprehension and write for various audiences. Math students use calculators and computers to problem solve. The science curriculum is a spiraling curriculum, where students spend a trimester in each of three major scientific areas. 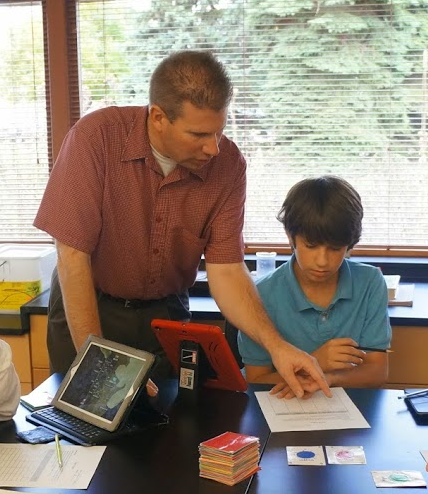 In earth science, students learn about ecology, ecosystems, nutrient cycles, weather, and climate. In the area of physical science, they explore Newton’s laws of chemistry. And in biological science, they explore the world of genetics, heredity, cells, and body systems. Social studies expose students to a broad scope of topics and explore the events that shape our world. Our Foreign Language curriculum which includes French, Spanish, and Mandarin language courses help students learn about new cultures and gain an awareness and appreciation of diversity. Upon completion of Middle School students continue to develop their foreign language writing and speaking skills in Upper School.